Now you can have it all… and more. First in its class, the Cabana Suite Spa brings you a year-round dream vacation that you keep in your own back yard. Beginning with a protective Weather Shield umbrella and spa cover, plus a large inviting Suite Step entry with planters, storage and handrail, you’ll experience the value from the start. Inside you’ll enjoy the perfectly formed seats, soft contoured head rests, entertainment table and built-in cooler compartment. 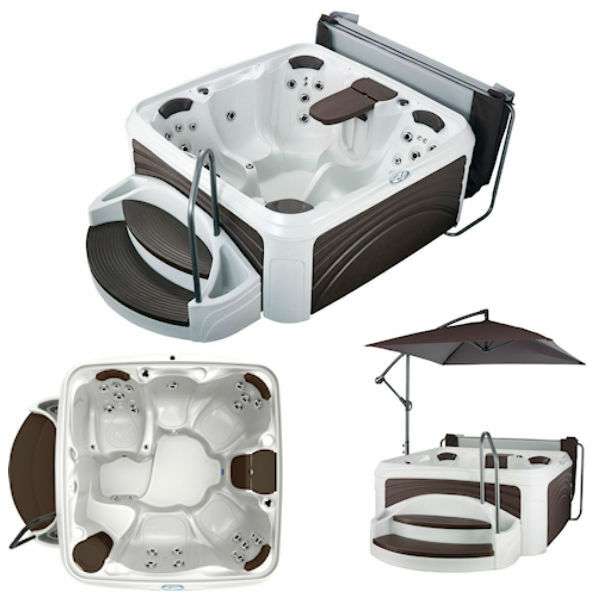 This 4 person hot tub with open seating has 25 adjustable jets that target shoulders, back muscles and feet for a massaging hydrotherapy experience. Enjoy the comfort pillow headrests to enhance your relaxation. For entertaining or unwinding, the Fountain with Back-lit LED Light and 8 exterior cabinet lights allow you to set the perfect mood. Select the perfect temperature, jet speed and lighting scheme using the Proprietary Digital Controls. The spa is powered by a 3 HPR pump. This 120V 50 amp spa is a plug-and-play model. The free Weather Shield Deluxe Super Seal Cover fits into a deep recessed interlock cover channel to seal in heat, keep out debris and protect your spa for peace of mind. Each spa comes with cover seal strap latch clamps for extra security. Come home to the elegant Cabana 2500, the ultimate for relaxation, entertainment and family fun. 80" X 80" X 34"